← What is the Meaning of the Sacred Heart of Jesus? “Virgin of Fátima, Mother of mercy, Queen of heaven and earth, refuge of sinners, we consecrate ourselves to your Immaculate Heart. To you we consecrate our hearts, our souls, our families, and all we have. “And in order that this consecration may be truly effective and lasting, we renew today the promises of our Baptism and Confirmation; and we undertake to live as good Christians – faithful to God, the Church and the Holy Father. We desire to pray the Rosary, partake in the Holy Eucharist, attach special importance to the first Saturday of the month and work for the conversion of sinners. 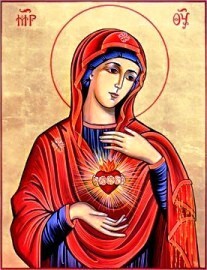 IMMACULATE HEART OF MARY, SCAPULAR. Badge of the Sons of the Immaculate Heart of Mary. It is white, with a picture of the Heart of Mary surrounded by flames, surmounted by a lily, encircled with roses, and pierced by a sword. This entry was posted in Uncategorized and tagged IMMACULATE HEART OF MARY. Bookmark the permalink.